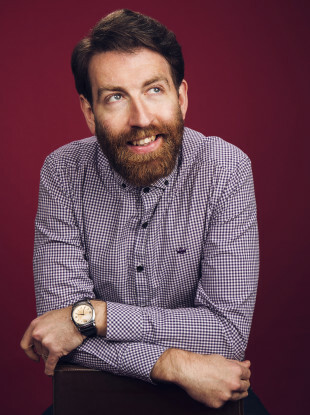 COMEDIAN AND COLUMNIST Colm O’Regan is probably best known for his amusing musings on RTÉ Radio 1’s Drivetime, and work on the BBC’s In The Balance and Talking Business. The author of three best-selling books, including Irish Mammies and Bolloxology, will be at The Gutter Bookshop, Temple Bar at 6.30pm Monday 25 March to talk about his new book: Ann Devine: Ready for her Close Up. His latest book tells the story of mother Ann who, described as a “riddle, wrapped up in a fleece, inside a Skoda Octavia”, joins the Kilsudgeon Tidy Towns Committee. “Yet all is not neat and tidy in Kilsudgeon,” so goes the description. There are strange sightings of people who aren’t local driving 4x4s with a yellow reg, a man bun requesting kefir in the restaurant and a quad bike at a funeral. If you’d like tickets for the event in The Gutter Bookshop, we’re giving a few away. All you need to do is send us an email at competitions@thejournal.ie to nab a ticket or two. Colm O’Regan’s new book is out tomorrow, 14 March, and is priced at €14.99. Email “Fancy tickets to a live Colm O'Regan talk in a Temple Bar bookshop?”. Feedback on “Fancy tickets to a live Colm O'Regan talk in a Temple Bar bookshop?”.